Information quality (IQ) plays a critical role in the ability of a high-level information fusion (HLIF) system of systems (SoS) to achieve actionable intelligence (AI). Whereas the need for information quality management in traditional information systems has been understood for some time, and its issues are fairly well mitigated, the challenges pertaining to the relatively new field of high-level information fusion remain significant. Principal and unique among these challenges are the multitude of issues which arise from the inherent complexity in high-level information fusion system of systems and which permeate throughout the various interdependent phases of its life cycle. Actively managing information quality in HLIF is essential in ensuring that they do not adversely impact decision-making and the ability to determine the best course of action (COA). 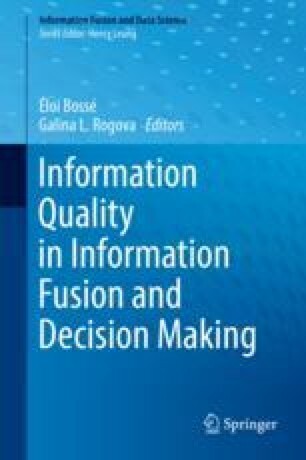 Accordingly, in an effort to advance this critical facet of high-level information fusion, this chapter proposes an end-to-end framework that enables (a) the development of an information quality meta-model (IQMM), (b) the characterization of information quality elements, (c) the assessment of impacts of information quality elements and their corresponding mitigation, and (d) the integration of these aforementioned objectives within the HILF processes and life cycle.